Sign up for Broadjam today to follow Kapitol Raid, and be notified when they upload new stuff or update their news! 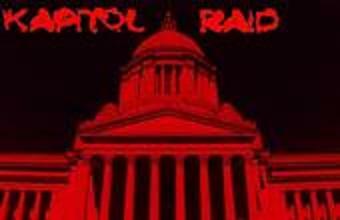 Kapitol Raid is a new up-and-coming metal band in Washington state. We're keeping our ears open for a singer/song writer and lead guitarist. If you do any of the above and want to be in our band, let us know! We have a lot of great opportunities in the making for us and hope you will be able to experience them with us! We'll keep you updated on any changes! Thanks for supporting KAPITOL RAID! Spread our name! You can also support KAPITOL RAID @ the following sites: www.unsigned.com/KapitolRaid, www.myonitlive.com/Kapitol_Raid, www.recordscout.com/Kapitol_Raid, http://www.reverbnation.com/kapitolraid, http://twitter.com/KapitolRaid, www.facebook.com/KapitolRaid. If you have any questions, you can message us or email us at KapitolRaid@ymail.com.